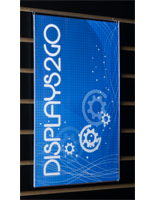 What makes wall mount sign holders popular displays to use for business advertising and important signage? 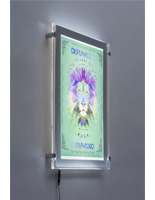 These clear acrylic slatwall pockets and mounted poster frames are very versatile and can be used throughout many venues to design memorable promotional campaigns. 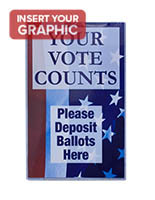 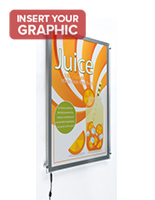 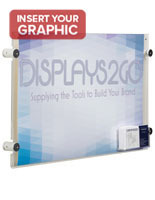 The easy top-loading wall mount sign holders have durable construction that can withstand frequent signage changes and also prevent damage to images hanging inside the poster frames. 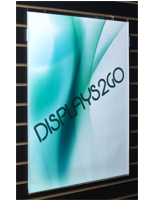 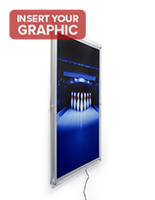 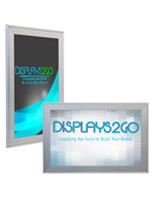 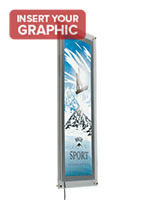 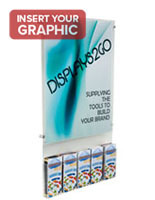 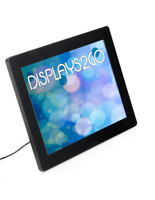 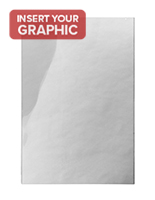 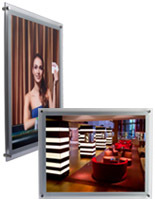 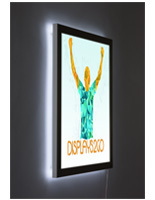 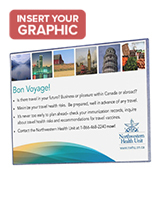 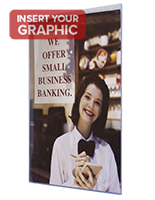 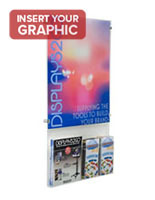 Many businesses buy the horizontal and vertical displays for mounting important information throughout the lobbies, hallways, and merchandising locations. 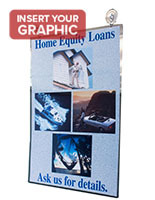 The wall mount sign holders, like gridwall frames, come in different sizes to accommodate small photos, standard sized print-outs and large posters. 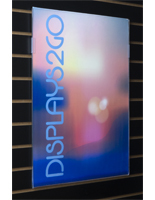 The clear acrylic displays are frameless so customers will see the complete advertising design presented without distracting borders. 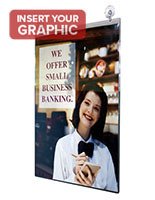 The wholesale slatwall poster frames have pricing that enables businesses with small advertising budgets to take advantage of these amazing clear plastic display frames. 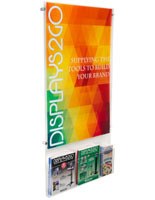 Use the hanging designs to inform patrons about sales, events and current policy information in a way that they are surely to get noticed. 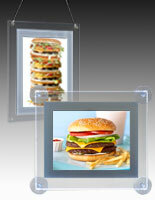 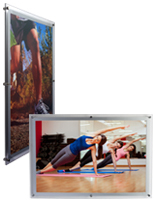 What styles and sizes are available in the slatwall frames & clear poster frame displays? 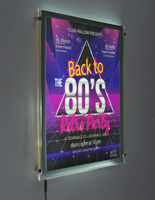 These wall mount sign holders are available in fairly standard sizes from 5.5” x 8.5” all the way up to 34” x 11” for impressive vertical and horizontal acrylic or plastic frames. 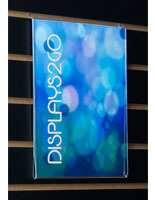 There are other displays in this category that aren’t clear Plexiglas. 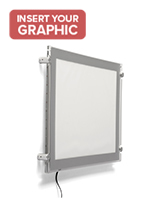 They are metal or plastic and attach to gridded structures. 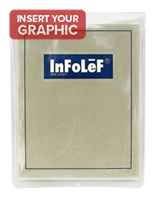 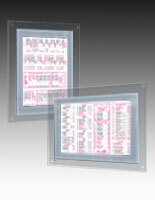 These frames feature wet-erase boards or lenses in plastic borders and range in size from 3.5” x 5.5” up to 22” x 7” to get easily seen by customers. 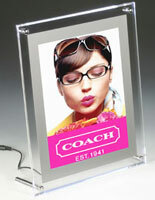 These wall mount sign frames have many mounting styles. 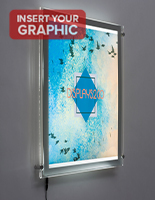 There are designs that fit into grooved walls and other that use adhesive tape to permanently attach to vertical services, like doors. 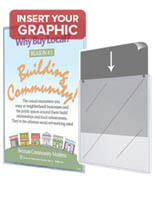 Suction cups to attach the signage to glass are available with some units, possibly along with chain to hang in windows. 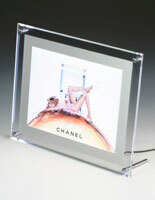 The slim light box models use hardware to attach vertically or horizontally and have the additional option of be placed on countertops as well. 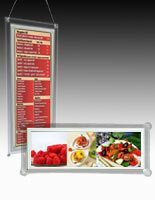 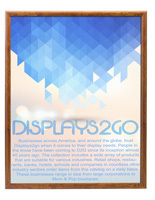 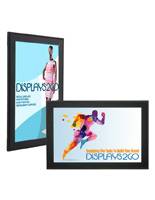 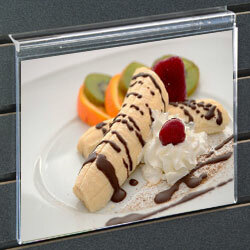 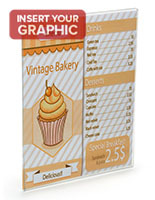 These frames are used in many types of businesses and commercial environments. 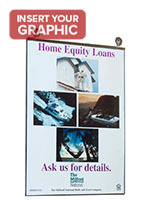 Financial institutions use the holders as hanging displays on their walls to inform patrons about current interest rates. 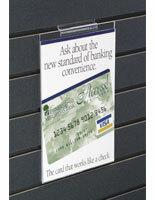 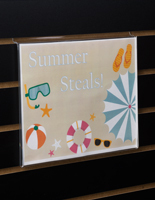 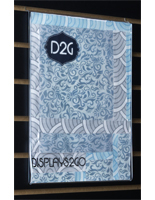 The wall mount sign frames are used by retail stores and restaurants to market upcoming specials in their storefront windows on the waiting area wall by using adhesive tape. 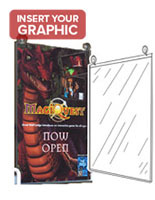 The great thing is the clear plastic can stay mounted and just the graphics comes out of the easy top loading pocket. 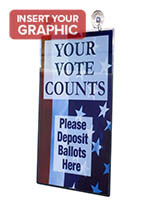 The signage can also present hours of operation or important safety information.